Intensive Registration - Dance Etc. Check the Requirements Document to see how many hours/what types of classes are required. Look over the Team Intensive Schedule for all your required technique classes and rehearsals. Choose any additional classes or workshops that you are registering for. Turn all this in to the front desk. We will figure it out from there! We're happy to help so bring all your questions. Registrations are due by 7/22. Any received after the deadline will incur an additional $15 charge so please make sure that you register early! Dancers who love to dance and wish to make improvements over the summer are encouraged to take advantage of additional classes. Why choose when you can do it all?! We are offering an “unlimited” option which, for just $30.00 more (1-6 hours) or $50 (7-14 hours) allows the dancer to take as many classes as desired. Why not attend as much as possible to make the most improvements before fall begins? Once again, we are offering a fun Intensive T-shirt or Tank. Everyone always loves to wear these throughout the years. The deadline to order it, however, is July 22, so make sure you get your registration in early! 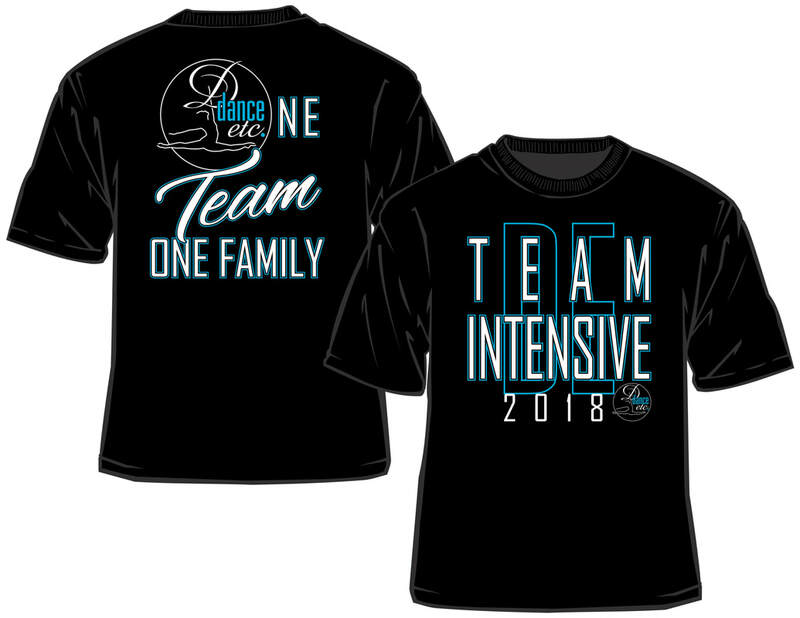 Those who register for a 7+ hour camp (not including Richard Elszy) AND pay in full by 7/22 will receive the Intensive T-shirt FREE! You may choose a tank instead of a T-shirt for an additional charge. For ballet classes, the dress code is pink tights (no holes or runs), black leotard, pink ballet shoes and hair in a bun. (Our ballet teachers are very strict about having hair in a bun, so please bring supplies in case yours does not pass inspection.) Teachers do not like visible sports bras or booty shorts. Warm-ups can be worn for the beginning of class only. For all other classes, dancers may wear their choice of dance clothing as long as they are wearing the correct shoes (not just socks)! If you are understudying a team, you are welcome to attend the choreography (since it is always best to learn the choreography when it is first taught), however, it is not mandatory.